DoubleD Athlete: 10k Turkey Trot- New PR! Every Thanksgiving since 2009 D and I have done the Thanks-4-Giving race in Lowell. The first year I did the 5k last year was 10k and this year 10k again. I have gotten to know the course very well since I have run these races on it and the New Years 10k and all the Lowell Triathlons are on a similar route. Earlier in the week I wrote down my course PR and my 10k PR on a post it in my office and calculated the pace I would want to go if I wanted to break either. First goal: beat course time of 1:05:14 Goal 2: beat PR of 1:03:05 Goal 3: go for an hour or under. I had seen my other paces and knew I was going to be able to beat goal one, and I was getting close to being able to beat goal two. Okay time to be sure to kick it in- only 2 miles left come on.... Back on pace with mile 5- 9:33. Miles 5 and 6 are the flat stretch of road on the course so I knew if I could get comfortable and cruise I would be okay. Somewhere in mile 5 it hit me not only was I going to beat goal two now but I was possibly going to make it for goal three. Okay Juls put your head down and get this done. Mile 6- 9:39. I honestly have no idea where the mile marker was or when my watch went off but I knew it was time to finish strong. D came out and finished with me. I told him I couldn't talk. I just wanted to put my head down and finish. I wanted to finish in 1:00 or under. He helped push me through to a strong finish. As I crossed the line a friend who had finished around the same time as D was cheering and taking photos. I looked down at my watch when I crossed 1:00:48. I DID IT! Goal One, Two and Three done! I couldn't have been happier. The last lil bit was at 8:42 pace. The course was 6.3 mi according to my garmin and 2 other people's also- so 6.3mi 1:00:48 works out to 9:39 pace. Race results with 6.2 mi course say 9:49 pace. 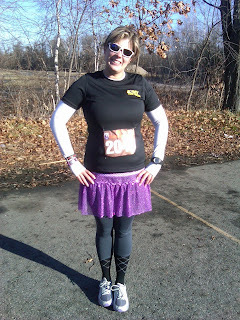 For the record: that's 2 PR's in my new Team Sparkle skirt.... maybe the thing has magical powers?! That's awesome! Congrats!!! Nice job pushing through to a new PR!! Wow! That is awesome! Congratulations on the PR! And way to rock the sparkle skirt! LOVE IT! I love a PR! Congrats! Thanks guys! I had a great race and it was a fun one. I am having a pretty good winter training/racing season!